CHECK OUT NJTIP SUCCESS STORIES! The mission of the New Jersey Travel Independence Program (NJTIP) is to increase the independence and self-sufficiency of people with disabilities, older adults and others by empowering them to use the public transit system safely and independently. In 2013 NJTIP merged with the Alan M. Voorhees Transportation Center (VTC), a national leader in transportation research and education and the nucleus of transportation-related policy research, training and education at Rutgers University’s Edward J. Bloustein School of Planning and Public Policy. Check out our services summary! Since 2005, NJTIP has worked with a variety of government agencies, community organizations and schools to teach travel skills to more than 10,000 individuals. Travel Instruction is a spectrum of services meant to teach safe independent travel skills on public transit: the bus, train, light rail, county and private systems. 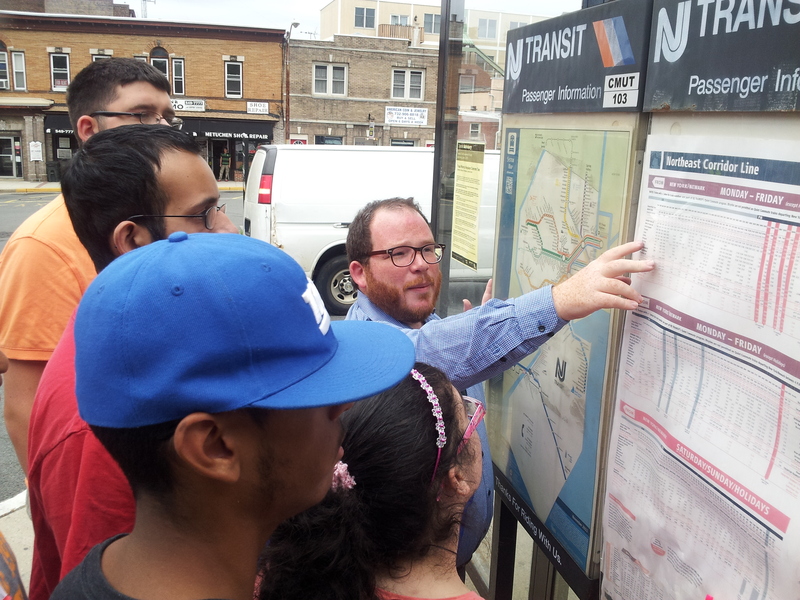 NJTIP customers learn how to read bus and train schedules; plan their trips; pay their fares; and take safety precautions. After finishing training, our customers enjoy traveling on their own to go to work, school and medical appointments and to visit family and friends. NJTIP Travel Instructors are seasoned professionals with experience in teaching, special education and assisting individuals with special needs. NJTIP One-on-One travel pairs each customer with a Travel Instructor. The instructor teaches travel skills by riding on the bus or train with the customer until the customer is ready to travel independently. The only cost to customers during training is paying their own fares. Each graduate receives a free one-month bus pass. One-on-One services are available to customers who have applied to Access Link and live in Bergen, Camden, Essex, Hudson, Middlesex, Morris, Passaic, Somerset, and Union Counties, except for those with visual impairments. Our Small Group Travel Instruction Familiarization & Orientation programs benefit senior citizens and people with disabilities who do not need intensive one-on-one training and enjoy the camaraderie of learning in a group setting. Groups participate in classes and escorted trips to popular local destinations such as shopping malls, supermarkets, and transit hubs. NJTIP Travel Instructors teach professionals and volunteers from social service agencies, schools, and senior residences how to become informed advocates for public transportation, so they can better assist their clients, students, and residents with navigating the public transportation network. NJTIP has developed classroom curriculum for students in high school transition programs. NJTIP Travel Instructors teach weekly classes at each school and lead monthly field trips for practical experience. We also teach traffic safety skills and bus familiarization for students who are not ready for independent travel. Please fill out this ONLINE FORM and we will get back to you soon! NJTIP @ Rutgers provides travel instruction in a learning environment that is free from discrimination on the basis of race, color, national origin, disability or membership in other “protected classes.” For more information please see: Attachment A – Notice to the Public.